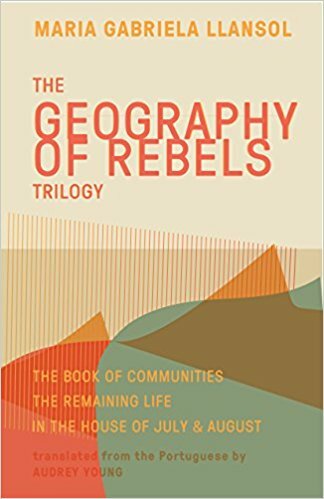 Geography of Rebels gathers three short books by the Portuguese writer Maria Gabriela Llansol, who was born in Lisbon but moved with her husband to Belgium during the regime of António de Oliveira Salazar. There they joined a cooperative in the hamlet of Herbais, taught at an experimental school, and made and sold furniture and food. In The Book of Communities, The Remaining Life and In the House of July and August, fragment flows into fragment with a marked disinterest in any conventional plot that might guide the reader, yet a common tone binds the three works. Names recur, most notably that of Ana de Peñalosa, along with those of several famous, mostly German, mystics from the past. As this group goes on walks, talks, observes the surroundings and writes, Llansol inhabits one mind after another, constantly shifting the view. Her memory ebbed away as if she were old. Or as if she were about to begin another life with new memories forming. The knowledge she had laboriously learned in adolescence and childhood abandoned her quietly, leaving no trace. She was not sorry, nor did she feel the need for it. She then decided she should write, a skill she still remembered, what she thought. The same or a different one. She died, but metamorphosed, taking an absurd transitory form, stitched together by her new memory. Llansol’s books explore the notion of a mystic view of history. She is particularly interested in medieval Germany, from its peasant revolts to its philosophers. But she is not a social historian engaged with external events; rather, she takes a view inspired by her readings from theology and literature. Nietzsche is one influence, made explicit in phrases like “in the eternal return, Ana de Peñalosa saw Nietzsche coming out of the darkness and suffused with language descending the river, the river of the idea.” This “river of the idea” is extended in explorations of the Tagus, Tigris and Euphrates, and is suggestive of a notion of both flowing prose and flowing time. “It is in exile, in the outside of the outside, that the network of figures, like Ana de Peñalosa, Nietzsche, Saint John of the Cross, Eckhart, Müntzer, Hadewijch, and others, takes root in order to receive the myth of the remaining life, and wonders whether there will be a place in the human body, among their bodies, where fantastic cosmogonic changes correspond to incredibly slow social mutations,” writes Llansol. By “remaining life” she refers among other things to the life that always remains outside oneself, all those other selves possible. Llansol’s perspective is rooted in her understanding of the historical mystics she mentions, who were able to articulate the relationship between individual body, collective body, God and history. As she enters different minds, all the same I, there is no exclusivity of affection. The materials for anecdote invariably disperse and leave behind traces, as a direct relationship with God means that the writer’s voice can echo everywhere, situation ebbing into situation, contours blurring. A passivity exists in the organic flow of Llansol’s “experimental mysticism”, but this passivity need not be isolating, as Llansol develops the idea of a community of consciousness. A community is a group that we belong to by choice, aesthetic association, closeness in tone, and preference for levels of hardness or softness, irony and sincerity. What does it mean to think of mystics from the past as not dead personages, but friends still living, with whom you can walk, chat and feel? What does it mean to create a community with the dead as real as if those people were alive? Llansol’s method of writing draws attention to her process of reading, in which she does not see books as entities outside herself. When she reads the diaries of others, she incorporates their experiences, assuming them as part of her own life. Names might be understood as allegories for real people (“Neither Hadewijch, nor Nietzsche, nor Saint John of the Cross, nor Eckhart, nor Beatrice, nor Lorenzo de Medici, nor Müntzer were present but they could not be distinguished from celebrated words and real tenderness”) but they are not only this. Drawing from real biographies, Llansol constructs an archetypal landscape in her imagination, in which all figures are present at once, interacting in the most physical way possible. It was a pure and verdant language, with resonances of a journey, a well dark in its depths, an animal lying in the water that I took for a reflected white form, with fur, wings, and a strong, agile skeleton where I passed by without finding myself; it was a language still so young and perfectly bright that I used it to begin thinking about what, in the future, I will write to you. 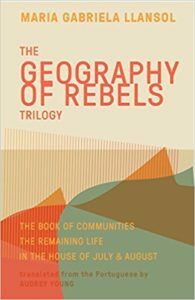 Geography of Rebels is an exploratory text, not the kind of narrative that Deep Vellum usually publishes. Although the editors and translator have not reorganized the content, they have made the editorial decision to publish these three short individual novellas as one tome, and to retrieve this work by a female author interested in mysticism. Whether this represents a hat tip to contemporary trends of publishing women or a deeper interest in such meditative works remains a mystery. The marketing material pushes comparisons to Clarice Lispector, but beyond the common substratum of Portuguese, the two writers really are quite different. Lispector is highly self-conscious, and coy with the desire of her readers; her prose often resembles an extremely sensuous yet detached game of cat and mouse, always coming back to an exploration of her own self. Llansol reads as more sincere, more genuinely absorbed in religion and historical mysticism, less interested in “hooking” the reader or crafting infinite strategies to attract the reader to what she is saying. She does not seem to be interested in the kind of games that Lispector and others play (even if they ironically deny playing them), and she is only just barely interested in the artificial exercise of editing and rearranging paragraphs into neat shapes. Life for Llansol, at least going by these books, seems to have been something more flowing and organic than even an agua viva of the “I” as Lispector defines it. A great part of the appeal of Llansol’s work is the way that it follows the consequences of dissolution to their extreme, as the “I” transforms into other people beyond oneself, the present moment transforms into other histories beyond the present time, and human contact transforms into a wholeness beyond the constraints of the written page. Jessica Sequeira is a writer and translator from California, currently living in Santiago de Chile. Her works include the collection of stories Rhombus and Oval (What Books), the collection of essays Other Paradises: Poetic Approaches to Thinking in a Technological Age (Zero) and the bilingual collection of poems Diversion and repose / Diversión y reposo (Pez Espiral). Her translations include Sara Gallardo’s Land of Smoke (Pushkin), Liliana Colanzi’s Our Dead World (Dalkey Archive), Hilda Mundy’s Pyrotechnics (We Heard You Like Books) and Maurice Level’s The Gates of Hell (Black Coat).